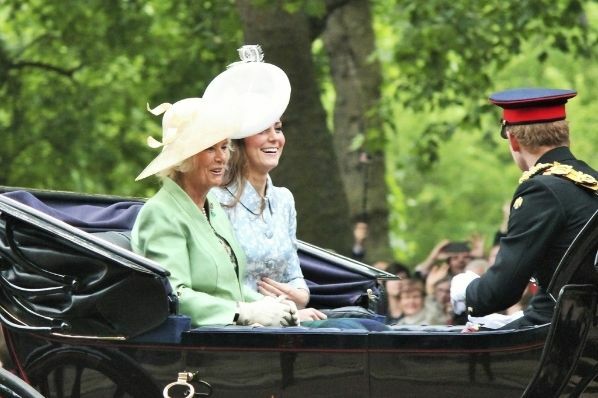 IWF - Is Camilla the Wicked Stepmother in the Royal Family Drama? Just in time for Mother’s Day, bestselling royal biographer Christopher Andersen is out with his latest book, Game of Crowns: Elizabeth, Camilla, Kate, and the Throne, which portrays Prince Charles’ second wife, Camilla, Duchess of Cornwall, as something of a wicked stepmother. Take, for example, what the New York Daily News called Camilla’s “Lady Macbeth-esque plot” against Kate Middleton before the couple married, when she reportedly encouraged Prince Charles to interfere and urge his son to break it off with the future Duchess of Cambridge. The plot, if it actually existed, nearly derailed the romance. According to Andersen, Camilla, then still Mrs. Parker Bowles, was “disgusted with William and Kate sucking up all the attention” because she was trying to win the hearts of the public in the aftermath of Princess Diana’s death. A descendent of Alice Keppel, society hostess and mistress of King Edward VII, Camilla’s first recorded words to Prince Charles were, “My great-grandmother and your great-great-grandfather were lovers. So how about it?” Having grown up in and around court circles, Camilla is said to frown upon her step-daughter-in-law’s more ordinary family background, believing that Prince William should have sought a bride among the remnants of Europe’s royal princesses (alas, a very limited source of wives, given how the Russian Revolution and associated historical events have vastly reduced the eligible princess population). Still, Camilla, who was once dubbed “Frump Tower” by The New York Post while she was on a trip to New York, would have to be super-human not to be a bit jealous of the former Kate Middleton. Prince William’s wife never puts a foot wrong—this is a duchess who even knows how to let her skirts be blown up by the wind in an alluring but ladylike fashion. As an inveterate consumer of royal biographies (it is my not-so-secret vice), I would venture to say that Kate, the daughter of a former flight attendant, bids to be every bit as successful in the job of Queen consort one day as the last non-regnant Queen of England: the late Queen Mother. Despite the enormous difference in their backgrounds, temperamentally, both ladies were born to be Queen. Camilla, on the other hand, was born to be a royal mistress; she is far too concerned with her public image and celebrity than a future queen should be. And if Prince Charles reneges on his promise not to have her crowned with him, he will do a disservice to the standards for which monarchs (now that their actual power is gone) must stand. The difference between royalty and mere celebrity is that royalty must have a sense of duty. Kings and queens are often as intellectually dim as celebrities (being your own third cousin many times over apparently isn’t good for one’s mental acuity), but they do have a job: doing their duty. It’s what makes them more than mere income producers for the paparazzi. Nobody failed to understand this with graver consequences than Prince William’s late mother, the rebel Princess Diana, and nobody understood it more intuitively than the late Queen Mother. “Duty is the rent you pay for your life,” she said, and she lived by this motto. “A family on the throne is an interesting idea,” wrote Walter Bagehot, the Victorian authority on the constitutional monarchy. “It brings down the pride of sovereignty to the level of petty life.” But it also elevates marriage and all the aspects of our petty lives to another level of importance. Royal families make regal the mundane parts of being a spouse and parent (and child). Perhaps the nicest photograph among the many taken to celebrate the Queen’s ninetieth birthday was the one of her with all her grandchildren and great-grandchildren. One little girl is holding the Queen’s famous purse—how sweet that royal Granny had the sense of humor to permit this! The English royals have only duty to keep them from becoming mere celebrities (or worse, former royals). Marrying, having children, and cutting endless ribbons—it’s what they do. But within the rigid framework of royalty, there is room for love. When Prince William slightly touched his Duchess on their wedding day, during the carriage ride from Westminster Abbey back to Buckingham Palace, I saw a glimpse of the love, closeness, and ability to work together, even in the most tedious or trying circumstances, that made his great grandparents, George VI and Elizabeth, a beloved and successful modern couple on the throne. By contrast, Prince Charles and Camilla’s road to marriage was tabloid fodder, marked by lies, infidelity, and scheming; duty took a back seat. “A royal mistress should curtsey first, then leap into bed,” Alice Keppel said. In other words: a royal mistress knows her place, something Camilla clearly never did. Modern royals have an odd job. They live out their life cycles in public and uphold tradition during times of great change; they must marry, have babies, christen those babies, and start the cycle again. Camilla on the throne interrupts that cycle because she was first a mistress, then a divorcee, has no royal offspring, and yet now aims to be Queen. As Walter Bagehot noted: “A princely marriage is the brilliant edition of a universal fact, and, as such, it rivets mankind.” Sorry, but Charles and Camilla don’t rivet; Kate and William do. Only time will tell which woman will end up Queen, but Kate can already claim victory in a larger battle: winning the public’s hearts.